Beat Happening is an American indie pop band formed in Olympia, Washington in 1982. Calvin Johnson, Heather Lewis and Bret Lunsford have been the band's continual members. 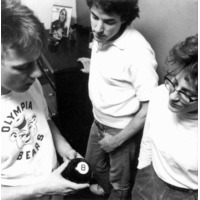 Beat Happening were early leaders in the American indie pop and lo-fi movements, noted for their use of primitive recording techniques, disregard for the technical aspects of musicianship, and songs with subject matters of a childish or coy nature.